The Kodiak Electric Association Inc. (KEA) is the power provider for Kodiak, Alaska, located on Kodiak Island some 250 miles from Anchorage and accessible only by sea or by air. So naturally, the KEA Board of Directors’ vision is to maintain 98 percent of kilowatt-hour sales with cost-effective renewable power solutions. Since 2014, KEA has had near-100 percent renewable portfolio generated from the Terror Lake Hydroelectric Facility and the Pillar Mountain Wind Farm. Generating green power from local sources has also kept the cooperative’s electric rates stable while eliminating fossil-fuel emissions by not running diesel generators. In an effort to increase its power supply, KEA is building the Upper Hidden Basin Diversion project. This project will increase the amount of annual hydropower production generated at the existing Terror Lake Hydroelectric Facility by an additional 33 million kilowatt-hours, which will add about 25 percent more energy to the facility. The additional hydropower production will go straight into the existing KEA grid for the direct benefit of KEA’s members. The Terror Lake Hydroelectric Facility is the primary source of KEA’s energy supply and is the cornerstone to its renewable wind-hydro energy generation system. When the Terror Lake Hydroelectric Facility was constructed in the 1980s, it included three additional watershed diversions that supply additional water to the hydropower system for increased energy production capability in addition to the Terror Lake Reservoir. A fourth watershed diversion named the Upper Hidden Basin Diversion was also investigated during the original development of the facility. This diversion was not built at the time due to the added expense and because the community did not need that power resource then, but it was recommended as the most cost-effective way to add future incremental power to the Terror Lake Facility and to the community grid when the growth in power demand in Kodiak justified it. The time has come for KEA to expand the Terror Lake Hydroelectric Facility by adding the Upper Hidden Basin Diversion. To assist in the planning and design for the Upper Hidden Basin Diversion, KEA enlisted the help of Lachel & Associates, a wholly owned subsidiary of Schnabel Engineering Inc. The late Dennis Lachel, the company founder, made a name for himself in Alaska by working on hydropower and DOT tunnels. As the project progressed, Lachel & Associates/Schnabel became designer of record for the project, conducted geotechnical investigations and wrote the Geotechnical Baseline Report. KEA then selected Kiewit as the construction contractor to build the $71 million Upper Hidden Basin Diversion project. Kiewit specializes in remote Alaskan construction projects and served as the general contractor for the original construction of the Terror Lake Hydroelectric Facility. NTP for the project was signed on Feb. 6. The bulk of the construction will take place in the 2018 and 2019 working seasons with final completion expected to occur in July 2020. Kiewit is mobilizing the equipment for the project and is scheduled to begin construction this June. All equipment and material will be shipped via barge from Seattle to Kizhuyak Bay in Kodiak. 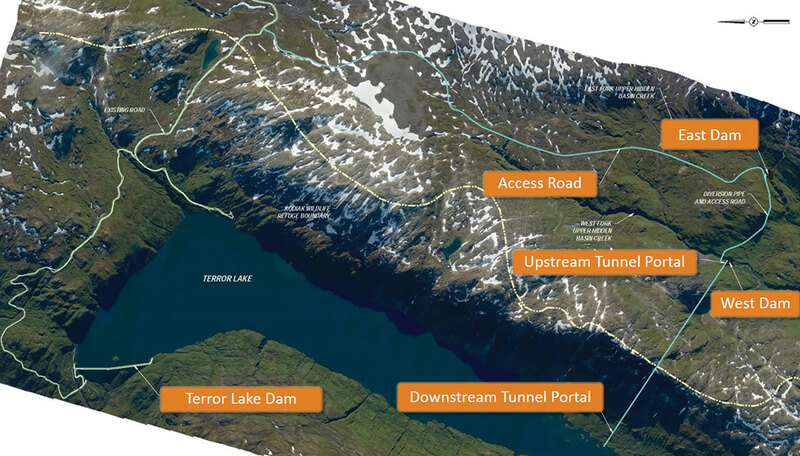 The purpose of the project is to supplement the existing Terror Lake Hydroelectric Facility with water supply to generate an additional estimated 30 gigawatt-hours of energy for Kodiak. The water supply will be supplemented by diverting additional stream flow from an adjacent drainage area of approximately 4 square miles, known as Upper Hidden Basin, through the new tunnel into the Terror Lake Reservoir. 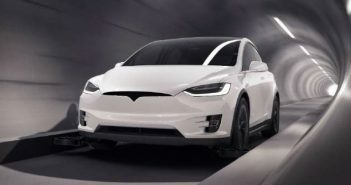 The project includes an approximately 6,400-ft long tunnel with an 11-ft diameter straight-leg horseshoe cross-section. The tunnel will be constructed by the drill-and-blast method with headings being driven from both portals. 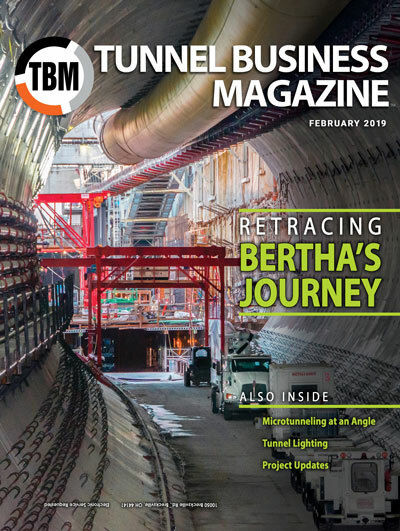 The design documents allowed either drill-and-blast or TBM, but the short length of the tunnel in combination with the logistics of transporting materials to the remote project site led to the contractor’s decision to use drill-and-blast. Interestingly, the original 5-mile long power tunnel built in the 1980s was built by TBM. Geology at both portals is composed of highly fractured metagraywacke, while the remaining approximately 85% of the tunnel will be driven through massive granitic geology of the Kodiak Batholith Formation. For the portal areas within the metagraywacke zones, the design calls for a supported excavation. Once the excavation reaches the granite zone, four levels of ground support have been identified and will be employed depending on the nature of the ground. 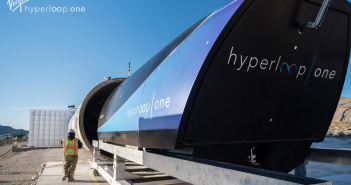 These ground support levels range from unsupported to full sets and concrete and will determined as the tunnel advances on a round-by-round basis. The tunnel has a straight alignment and will be driven on a constant grade of approximately 0.9%; maximum cover reaches approximately 1,070 ft. The other primary features of the project include a 4-mile long construction access road, two 30-ft high rock-fill diversion dams, and an approximately 3,300-ft long, 36-in. diameter conveyance pipe between the two dams. The remote location and weather conditions are the two major factors which influenced both the design and construction of the project. Kiewit will assemble two man-camps at the project to house all construction personnel. After the initial sea-going mobilization to Kodiak, all equipment and material for construction of the downstream portal will be trucked approximately 12 miles inland to the Terror Lake Reservoir. A second mobilization of material and equipment across the Terror Lake Reservoir will be required to gain access to the downstream portal. Two temporary docks will be constructed on Terror Lake to facilitate equipment, material, supplies, and crew movements to the downstream tunnel work. The docks and a barge for transport across the lake will be constructed using Flexifloat pontoon systems. “For the most part, we are expecting the tunnel work to be pretty straightforward; the challenging parts of the project are logistics and the weather,” Steve Brandon, project manager for Lachel & Associates/Schnabel. The main project features are situated between elevations 1,420 to 2,540 ft (msl) in a remote area of Kodiak Island adjacent to the Kodiak National Wildlife Refuge. The construction seasons will run from June 1 through Dec. 31 in 2018 and 2019, there will be no winter construction activities at the project site. Project Designer and Construction Services: Lachel & Associates/Schnabel Engineering Inc. Contractor: Kiewit Infrastructure West Co.